You can find the original pattern with step by step instructions (and videos tutorials) in my Post DIY Chunky Knit Cowl- A step by Step Guide. It is still a Super Bulky (6) yarn, but instead of being dense, it’s a standard yarn that is crinkled/ruffled to make it bulky. This bumpy yarn is a litter bit harder to knit (for a beginner). 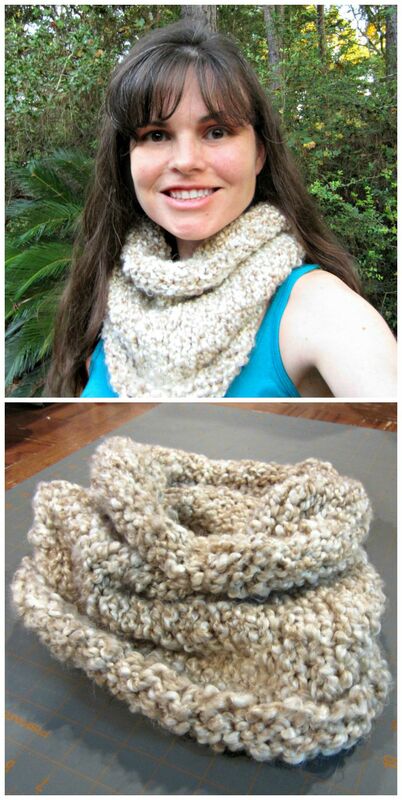 The texture of the finished cowl is so soft and interesting, and much lighter. Ok, technically only 10 grams lighter, but it seems much more air-y. The yarn technically calls for Size 15 needles… But I only have 13 and 17. The size 13 needles worked out just fine. is 227 grams, and I only used 150 grams for this cowl… so even if your gauge is a bit different than mine, you should only need to buy 1 skein. I also ordered the Bulky Yarn Tapestry Needles… they have a big eye and are slightly bent at the point… little features that make the task of weaving so easy! Knit 4 rows in stockinette stitch. Repeat ** until you have 50 stitches on your needle. Let me know if you’ve had any success with other Chunky Knit patterns! I’ll be sure to add them to my Pinterest board! Follow Cindy’s board Yarn Projects and How-Tos on Pinterest.